Highlights aren’t always white — they can be subtle nuances of yellows, pinks, blues, greens, violets, and more. 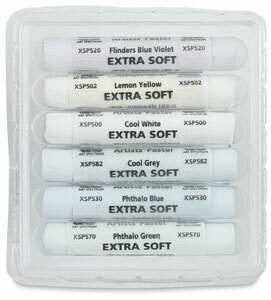 Art Spectrum Tints of White Extra Soft Pastels offer artists exactly that. The answer to every pastellist’s dream, these extra-soft, extra-pale highlighting colors are perfect for adding finishing touches, highlights, and subtle nuances, even over the top of many previously applied layers. 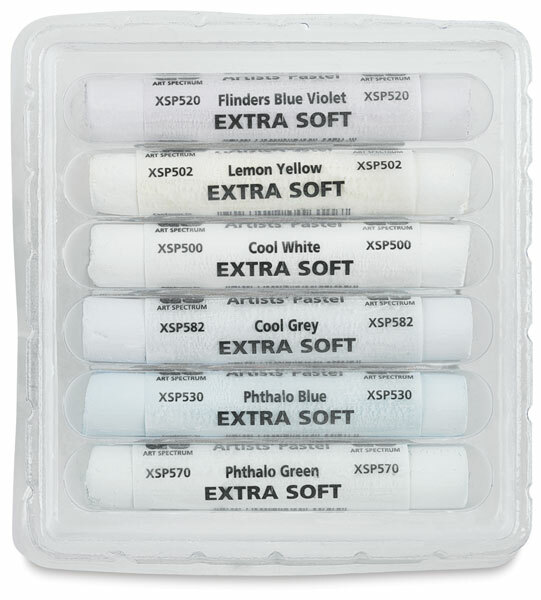 Cool Tints, Set of 6 — Includes Extra Soft colors: Flinders Blue Violet 520XSP, Lemon Yellow 502XSP, Cool White 500XSP, Cool Gray 582XSP, Phthalo Blue 530XSP, and Phthalo Green 570XSP. Warm Tints, Set of 6 — Includes Extra Soft colors: Ultramarine Blue 526XSP, Coral 507XSP, Yellow Green 572XSP, Flinders Red Violet 517XSP, Warm White 501XSP, and Spectrum Orange 506XSP.